Industrial fall safety harnesses are a crucial measure to take when protecting workers from drops and the impact injuries that can result. But prolonged suspension can also lead to suspension trauma, also known as “orthostatic shock while suspended,” orthostatic intolerance, harness induced pathology, or harness hang syndrome (HHS). While suspension trauma is a rare occurrence, employers and safety managers should be aware of this potentially serious condition, as well as tips on how to avoid it. Harness hang syndrome occurs when the human body is held upright without any movement. Such a situation may occur when, for instance, a worker using a fall arrest system drops and remains immobile in the harness, suspended in the air. Suspension trauma is primarily caused by venous pooling, or the accumulation of too much blood in the veins. As a result of immobility and gravity, blood begins to pool in the legs. Additionally, the pressure on the leg veins from the safety harness can compress the veins, further reducing blood flow to the heart. When the circulation is thus significantly impeded, the heart rate slows and the flow of oxygen to the brain is reduced. Eventually, the suspended worker will suffer a central ischaemic response, commonly known as fainting. Normally, fainting is the body’s way of re-positioning itself so that the head, heart, and legs are at the same level, and normal blood and oxygen flow is resumed. However, in a suspension situation, the harness prevents the worker from collapsing into a horizontal position. As a result, the faint fails to restore normal blood flow, and the brain and other major organs remain oxygen deprived. Serious health and safety problems can result. In fact, suspension trauma can become fatal in less than 30 minutes. All those who work at heights, or in any situation where harness hand syndrome is a possibility, should be well prepared. Employees should be trained to recognize the warning signs of suspension trauma, which include faintness, dizziness, breathlessness, paleness, sweating, hot flashes, nausea, “greying” or loss of vision, and unusually low or unusually high heart rate. Also, workers should be aware of the factors that affect their susceptibility to the syndrome, which include general health and hydration level. 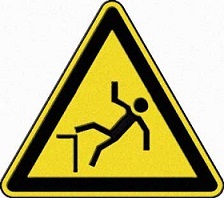 Your team can preemptively avoid suspension trauma by training in fall prevention and safety. Most importantly, an effective rescue plan should be set up and rehearsed so that it can be put into action in a timely manner when a drop occurs. Even with a comprehensive rescue plan firmly in place, crew members should be prepared with additional safety measures. The fall victim should be continually monitored and instructed to pump the legs frequently in order to increase blood flow and prevent pooling while awaiting rescue. An even more effective method is to use suspension trauma safety straps. These sturdy accessories provide hanging workers with footholds that allow them to simulate standing on solid ground. Standing slows the progression of harness hang syndrome by causing the leg muscles to contract, putting pressure on the veins, which helps blood flow to the heart and reduces blood pooling in the legs. Once the suspended worker is rescued, he or she should be immediately examined by a medical professional and continuously monitored for delayed internal effects, such as kidney failure. If unconscious, the worker should be resuscitated according to the standard procedure. 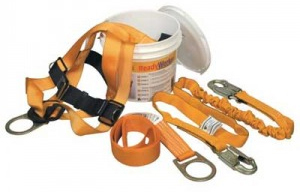 These simple preparedness steps and tips should be sufficient to prevent harness hang syndrome. A little background knowledge and some practice with suspension trauma relief straps could save lives. In 2010, women accounted for 46.7% of the workforce. More women than ever before are choosing non-traditional occupations, such as welders or electricians. The problem is most occupational safety equipment were meant to fit men. However, the good news is that some companies have recognized this problem, and designed their products to fit the smaller frame of a woman. Women’s Safety Glasses: A large selection of lighter, smaller frames and stylish designs mean women don’t have to sacrifice comfort for protection. All our Womens Safety Glasses meet ANSI Z87 high impact standards, and protect against harmful UV rays. Women’s Welding Gloves: AngelFire Welding Gloves are just as tough as men’s welding gloves, but cut smaller and thinner better fit a woman’s hands. Available in TIG Welding and MIG/Stick Welding styles. Womens Welding Coats: AngelFire Welding Coats feature a contoured body, tapered sleeves and high collar, eliminating gaps that can leave skin exposed to sparks. Choose the 9oz FR Cotton Welding Coat for light jobs, or the Hybrid FR Cotton/Pigskin Welding Coat for heavy duty protection. Women’s Fall Protection: The Ms. Miller Harness is the only full body harness specifically designed for the female worker. Made from a blend of Polyester, Nylon and Lycra, its straps are cut fuller in the hips and higher in the chest, making it much more comfortable for women. So come on ladies – Don’t settle for just any safety equipment! Choose equipment designed with you in mind! As many of you know, the new rules for residential fall protection are now in effect. This new directive states that people working in residential construction must use conventional fall protection and can no longer use other methods such as slide guards instead when working at heights of over six feet. OSHA is aware that implementing these changes may be difficult for some contractors. Last week OSHA announced a three month phase-in period for this directive to give contractors time to comply to these standards. Sites found violating this directive between June 16, 2011 and September 15, 2011 will NOT be fined if they are in compliance with the old directive. They will be issued a hazard letter with recommendation of how to comply to the directive. As this is one of the biggest changes OSHA has made in recent years, it makes sense to go over a few of the details in this new directive. Residential Construction is defined as a structure that will be a home or dwelling and is being constructed with predominantly wood frame materials and methods. Your fall protection plan must be site-specific and in writing. Acceptable fall protection options include guardrails, safety nets, a personal fall arrest system, or a personal fall restraint system. OSHA presumes that conventional fall protection on a site is feasible. Contractors must pre-plan and consider how to implement conventional fall protection whenever possible. This directive applies to states with federal-run and state-run OSHA programs. This is a lot to deal with, but there is help! For small and medium-sized businesses, OSHA’s On-Site Consultation Program provides free and confidential advice. Now is the time act and avoid fines and more importantly injuries.